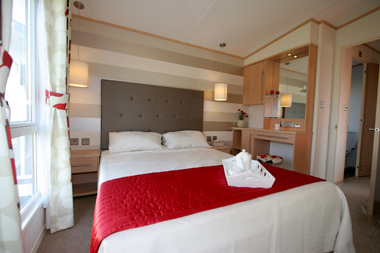 The Avalon Leisure lodge is one of the new lodges made by Victory Leisure Homes and bears the Victory trademarks, as expected. The open plan kitchen/living/dining room has sliding patio door and three-quarter height windows, so it’s light and airy. The curtains are a touch nostalgic with a 1960’s floral design but all blends well with the very 21st century pear wood wall hung furniture and freestanding coffee table. The electric log effect fire is set in a granite look hearth with a television socket and power point for the optional TV above the fire. The huge L shape sofa is a neutral colour with red scatter cushions to harmonise with the curtains. Four sculptured chairs are set at the dining table, which is by a full height window which has space saving, yet practical, vertical blinds. High gloss cappuccino cupboards and matt black granite look worktops feature in the well-specified kitchen and there is a three-quarter height window in the side aspect so the view, hopefully, is enjoyed. The half height room divider ensures that those in the lounge don’t see what’s going on in the kitchen, but the day’s cook can enjoy the company. The hall is simple with coat hooks and a radiator; it leads to the main bedroom with its cream, silver and mushroom feature wall and bed with a luxurious Warwick Stamp vinyl quartz padded head board; it’s sort of high street Laura Ashley quality. 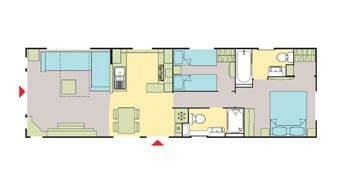 There’s plenty of storage space for personal possessions with a fitted wardrobe, drawers and open shelves. If you want to preen, then the attractive dressing table fits the bill! 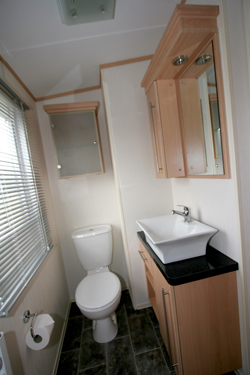 The en-suite bathroom has a not-quite-full-size bath but does have an over bath shower, a rectangular basin set on a pear wood vanity unit and a dual flush loo. What’s missing? Just somewhere for the towels to hang! The second bedroom has twin beds, with headboards and the feature wall; guests wouldn’t have to live out of their suitcases thanks to the wardrobe and drawers thus they could make themselves comfortable for a few days. The family shower room has a one-piece shower pod and the other essential equipment – except somewhere for towels to hang – again. I asked the Victory boss to the hang up his towel; he couldn’t. He tells me that he’ll discuss it with the design team, so watch this space! 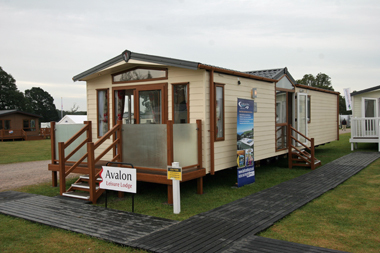 Standard features in the Avalon lodge include a Combi-boiler, oak or white PVCu double glazing, PVCu exterior cladding, integrated fridge and freezer, gas oven with a grill, a five burner hob with hood and extractor fan, a multi-function 800W microwave and a king-size lift up bed. 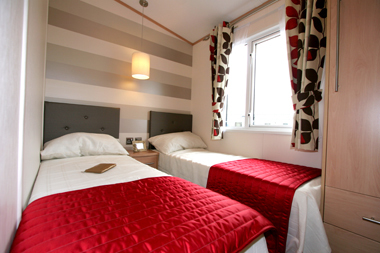 Verdict: it’s all that one expects of Victory with the signature feature wall in the bedrooms and harmonious interior colour schemes designed by the Victory boss’ wife, combined with an enviable standard level specification, quality build, value for money and a comprehensive list of optional extras to personalise your unit. 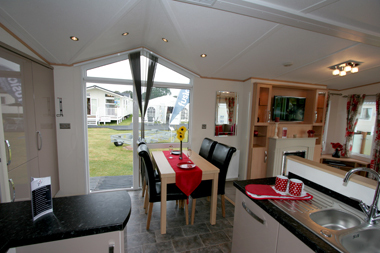 The lodge as seen is built to EN1647 standard for temporary holiday use, thus not designed for residential purposes, irrespective of the park’s licence, but it can be built to residential standard BS3632 at the time of ordering and will be 6ins wider and 12ins longer with a higher standard of insulation, improved heating as well as layout and detail changes. Please refer to the park licence and associated planning conditions when determining the build standard you want. *Additional charges will be made by park operators, and/or distributors for transportation, siting and annual maintenance. Please check the price carefully before you commit to purchase, as prices vary considerably dependent, amongst other factors, on the geographical location of your chosen park. 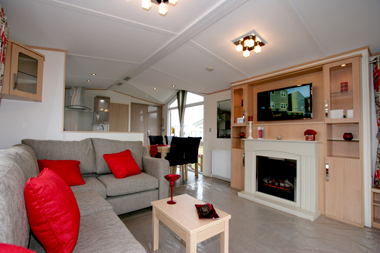 Get an holiday lodge insurance quote for this Victory Avalon Lodge.